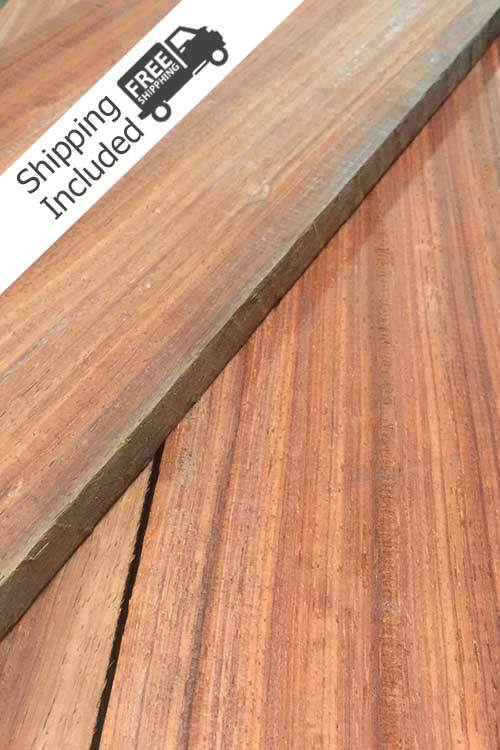 Colors vary, ranging from a pale pinkish orange to a deep brownish red..
Padauk Lumber Pack | 10bf | 25bf – You can specify widths & lengths in the order notes. Please use our board foot calculator to see what sizes fits within your request. Padauk lumber has heartwood color can vary, ranging from a pale pinkish orange to a deep brownish red. Most pieces tend to start reddish orange when freshly cut, darkening substantially over time to a reddish/purplish brown (some lighter pieces age to a grayish brown). The principal uses are veneer, flooring, turned objects, musical instruments, furniture, tool handles, and other small specialty wood objects. Available in up to 14 foot lengths in widths from 4 inches to 10 inches. Lengths are anywhere from 6 feet to 16 feet although for shipping UPS requires all boards to be 8′ or less.